States and international institutions have an obligation under international human rights law to respect, protect and fulfil human rights, including the right to education, not only domestically but also in third countries. This type of obligations are called extra-territorial obligations (ETOs). The Global Initiative for Economic, Social and Cultural Rights monitor the way international actors and donors fund and influence education, particularly in their support of private education, to assess if there is a risk of impairing the realisation of the right to education. The work has focused in the last years on the World Bank and its private arm, the International Finance Corporation; bilateral development agencies such as DFID and its private arm, CDC, in the UK, USAID and OPIC in the USA, or AFD and PROPARCO in France; and regional agencies such as the African Development Bank and the European Investment Bank. Part of this work is related to engaging with the investors of Bridge International Academies, a US-based chain of private schools that is believed to breach human rights. Since 2015, the Global Initiative for Economic, Social and Cultural Rights and partners have been engaging with the World Bank and its private investment arm, the International Finance Corporation (IFC) over their policies with regard to private actors in education. 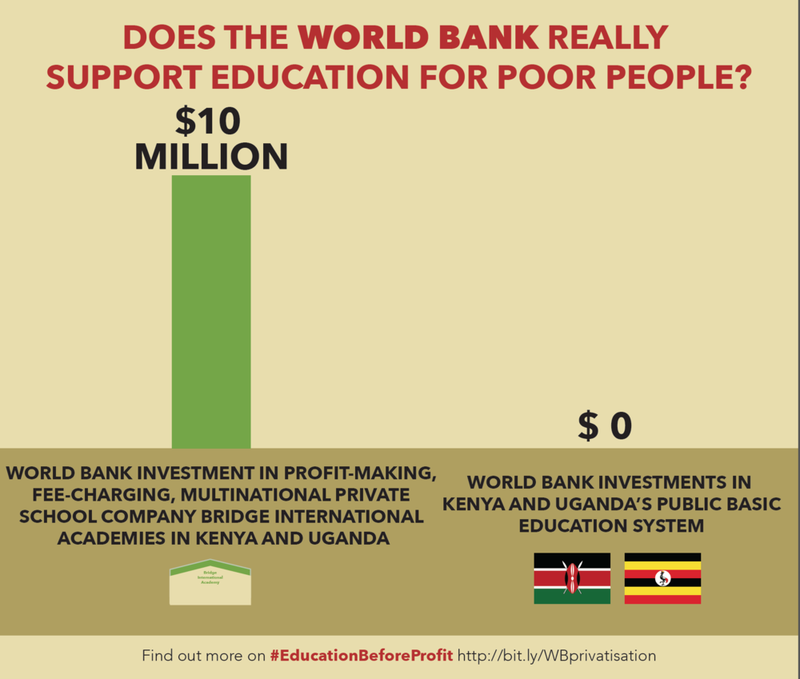 On 14th May 2015, 119 organisations released a statement and a letter which had been sent to the World Bank to raise deep concerns about the World Bank's support to private, for-profit, private school chain "Bridge International Academies" instead of public education. This was followed in 2017 by an open letter calling for investors to cease support to Bridge International Academies (BIA) by 174 organisations world wide. In 2018, a complaint by eight citizens from Kenya was submitted to the Compliance Advisory Ombudsman (CAO), the complaint mechanism of the IFC. The complaint was submitted due to concerns about the IFC's investment in BIA. The complaint alleges that the company's lack of legal registration, numerous complaints of exploitative labour practices, discrimination, lack of transparency and failure to meet national standards for education, and health and safety, violates World Bank investment standards, as well as national and international laws. The complaint was accepted by the CAO, and is ongoing. A decision on the allegations is expected in 2019. GI-ESCR also works with other organisations to advocate for the World Bank to set more strict standards for public-private partnerships. In November 2014, we worked with ANCEFA and other partners to put together a statement reacting to a report from the African Development Bank and other international organisations calling for support to privatisation in education in Africa. The statement, which was endorsed in just two days by 70 African and international organisations was launched during the World Human Rights Forum in Marrakech on 28th November - the Marrakesh statement. The statement is available in English, and in French, and was accompanied by a press release in English, and French. Since 2010 DFID has been one of the most important supporters of low-cost private schools, including commercial private schools. DFID, and its private investment arm the CDC Group, for instance have invested in Bridge International Academies. In April 2016, GI-ESCR worked with the Right to Education Initiative and other partners to submit alternative reports to the UN Committee on the Rights of the Child (CRC) and the UN Committee on Economic, Social and Cultural Rights (CESCR), highlighting concerns on the UK's Department for International Development's funding of for-profit low fee private schools. The CRC expressed concerns about DFID's “funding of low-fee, private and informal schools run by for-profit business enterprises” as it could have been contributing to the violation of children’s rights in recipient countries. The Committee recommended that the UK “refrain from funding for-profit private schools” and “prioritise free and quality primary education in public schools.” Reiterating these concerns the CESCR questioned the UK’s support for low-cost private schools in Ghana, Kenya, Uganda, Nigeria, India and Pakistan. In 2017, the UK House of Commons International Development Committee raised serious questions about DFID's funding support to low-cost private schools and BIA, due to concerns regarding the quality of education, relationship with governments, alleged lack of compliance with governments’ regulations, and high cost of fees. DFID also received the open letter sent to all investors in BIA. External documents that support our advocacy efforts for the right to education. Materials that can support other organisations advocating for the right to education. Collection of UN Concluding Observations that related to private actors in education.